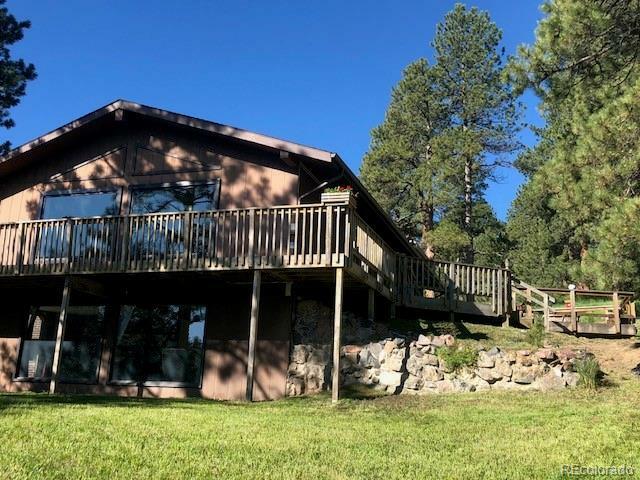 Don't miss this property located in the desirable Evergreen Highlands. Great location just 15 min. to C-470, 15 min. to downtown Evergreen or Conifer. 2 acres of usable, gorgeous land with a large flat field for a variety of uses. The home includes walls of windows on both levels to take in the views and wildlife that visit often. 2 gas log fireplaces, skylight, hot tub and a gas fire pit on the wrap around deck that overlooks much of the property. Great for entertaining. There is a newer 16x12 storage shed with electricity. RV parking, paved driveway. Bring the family, kids, pets and toys! Room to Roam and a very tranquil spot!